Create a Rocky Road No-Bake Cheesecake with little effort. 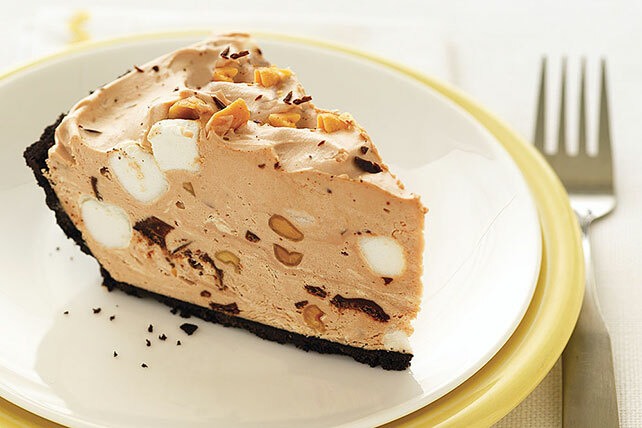 Our Rocky Road No-Bake Cheesecake is studded with delicious chocolate, marshmallows and peanuts. Microwave 1 oz. chocolate as directed on package. Coarsely chop remaining chocolate. Beat cream cheese, sugar and milk in large bowl with mixer until blended. Add melted chocolate; mix well. Whisk in COOL WHIP, marshmallows, nuts and chopped chocolate. Spoon into crust. Save 40 calories and 6g of fat per serving by preparing with PHILADELPHIA Neufchatel Cheese and COOL WHIP LITE Whipped Topping.